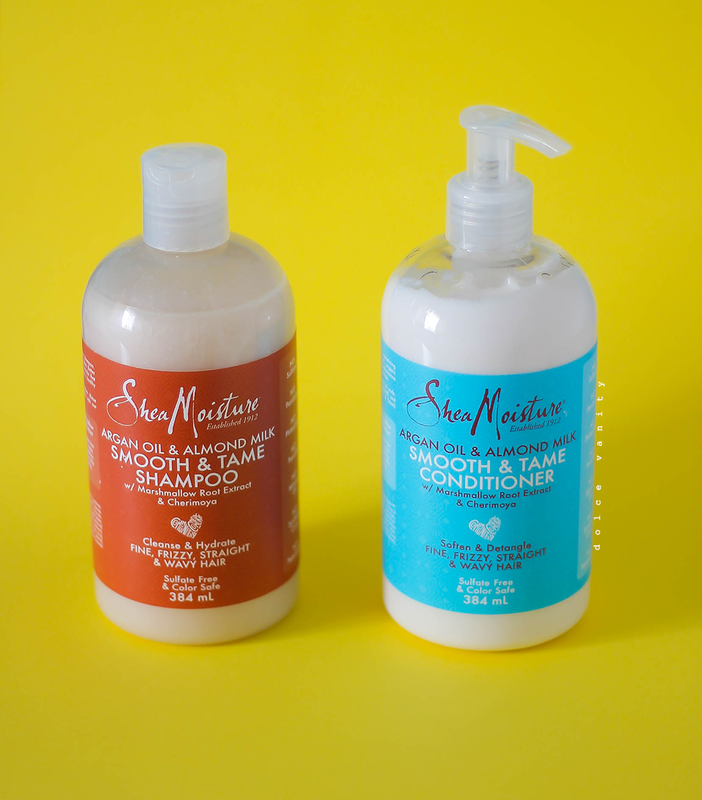 Admittedly, I’ve not used Shea Moisture products in some time, I used them religiously for years when I wore my hair curly frequently but then the formula changed and it seemed more watered down than it was hydrating and moisturising and my hair hated it. Disappointed as they were my go-to products. This year I took a chance and began using it again as I was kindly sent two items: Argan Oil & Almond Milk Smooth & Tame - shampoo & conditioner. With the shampoo being sulfate-free it’s ideal as I hate sulfate shampoo, my hair feels stripped, brittle and dry regardless of the follow up. The conditioner helps to detangle, smooth and revitalise the hair. As I’m wearing my hair more natural it’s important to keep every curl & strand, protected and moisturised. Since I’ve been using this for every wash day, my hair has been loving it. I do make sure to give it a deep condition after each wash & to use a leave in also. For me that is what works in my hair. The products smell nice, conditioner gives nice slip, I always use a little amount and apply to my hair and brush through with a WetBrush and making sure to use my Aquis towel, that helps to get excess water out & also helps with minimising frizz and breakage. Hopefully my curls will get a little more spring back into them, I had a cut last September and April to get rid of any dead ends. I got very lazy with haircare for a minute but I’m hoping to get the curls popping once again. My hair is straight as anything - but I love curls particularly when they are all soft and shiny. I haven't use any of these products before. I do like the idea of a sulfate free shampoo, I am actually using a natural one at the moment and it's so nutritious for my hair. Oooh I shall take a look at these, I have just started following the CG method for my curls and so always on the look out for great products. I have to admit Shea moisture is a fantastic brand they have some amazing products i love the argan oil one it made my thick coarse hair so smooth! I've not heard of this brand before, it sounds great though. I love using argan oil. I have curly hair too, it can be a nightmare finding products that work for it can't it?